How do I show a child the value of money? Mom used to sit with me and pay bills with me. Now, everything is all on auto payments. Does anyone have suggestions for how to explain how things work? My mom used an envelope method with me. If I did a task say one hour of basement cleaning, I got 4 quarters. If I wanted a record, candy, a shirt, and magazine, I would divide the quarters among the envelopes, until I got enough money saved up that I could get what I wanted. I learned quickly that more chores meant more quarters, which meant I could get to my goal faster. If after all my hard work, the item of desire became valueless because something else became of value, I learned to shift my money around to get what I wanted. It is all different today, but the basic principles of incoming and outgoing remains the same. You could teach about credit and interest, by letting them borrow and work to pay back with interest. That lesson was painful when my one dollar purchase became 1.50. Made it worth waiting for to get the candy and the eye shadow vs just the eye shadow. The check book can be a good math exercise to get it to balance. Hope these help you. I learned how to be frugal from this method! I am not sure some of the responders (like me) are the best ones to answer your question as so many things that we grew up with or even taught our children just do not relate to today's world. I noticed that some may tell how they were taught but fail to say how they taught their children (and did it work?). Its for sure my background would not be of help as I was not aware of money until I started to school and noticed that some children had money for lunch but I had a "paper ticket". Sometimes lessons are hard on small children. The one thing that I believe helped with money matters was that every child had a savings account but only one weeks allowance was mandatory to go to the bank so they had 3 weeks to handle their own money. Gifts, except at Christmas and Birthdays, were almost nonexistent. I did give my children an allowance but it had nothing to do with chores as chores were something every member of the family had to do and everyone just did what was on their list. But the list could change as each one became a year older and older children had more responsibilities. Did we have problems with this arrangement? Of course, we did but nothing major as we did what many parents no longer do, we did remain the parent and they remained the child. Are all of my 6 children budget wise? No, they are not but they do try to correct their mistakes so maybe we did something right. Today is an age of computers, ATM's, cell phones, etc so I feel it is much more difficult to teach about money (that is very rarely in your hand) than it was years ago. Perhaps you could read some of the ways that teachers and financial advisers are teaching as it seems their ways may better suit the actual world of today's children. I apologize for so many links but I read each one and it seemed there was some good in all so I just posted the ones I liked. I used Monopoly money to teach my grandson how to budget. 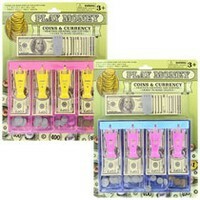 You can also get fake money that looks more like real money at the dollar tree. The tangible feel and denominations help. I think really the best thing is to establish a good work ethic and a real tangible memorable lesson about MONEY BEING A FINITE RESOURCE. The second is instilling in them the sense that they must do things to EARN money. Allowance never goes out of style no matter what tech is used; if you prefer you can even give him a paypal allowance. But always tie the allowance to chores, and if they are wheedling to buy something that they don't have enough saved up for (especially if its' something frivolous) DO NOT buy it for them. Make them earn it. Either give special projects (clean out the garage, paint the porch) or encourage them to entrepreneur it (Bake sale, lemonade stand, babysitting, etc) When I was 13 i really wanted a musical instrument - it was only like $250 but my parents simply did not have the $ so I managed to babysit all summer (though that was never my thing) and then I had the $. Check with your bank or credit union. They often have a program to set up a bank account and have some information to teach children about money. I would also include them in your family's finances and bill paying. Show them the accounts online and review them occasionally. I know it was eye-opening for my teen sons to realize that our mortgage was around $1000 a month. You could set a family budget and see if you can get them interested in saving money when shopping. School shopping is coming right up so that might be a good starting subject. My oldest took a personal finance class in high school and it seemed to put him on the right track for sensible money management. My youngest spends every dollar he gets his hands on so it can depend on personality. Saving money starts out small; pennies that can be saved to change into nickels, dimes and quarters as progress is made. If a child gets an allowance or gifted with money, let them save a part of it and spend a part of it...this teaches that all the money doesn't get spent, but a portion; set a savings amount. Open a savings account for your child and he/she can see their money growing and earning interest. This may be the incentive that helps save money and actually own their account. The child can add the interest amount to the total in the savings book and feel the importance on a grand scale to being a responsible saver of money. Discussing the value of a dollar by buying items when they are on sale and using coupons helps a child spend wisely and save too. Buying online with free shipping teaches cost cutting ideas. Yard sales and thrift stores can play a part in getting the most for their dollar. It shows a child to look at lots of ways of buying their want/need item w/o buying full price. Going grocery shopping with you is a great way a child can look at items on a shelf and find a lower priced item among the other brands, or to calculate the cost of each item and let them see how easy it is to spend money on food they eat daily and the cost to feed a family for a week. That's a real eye opener and you are making a fun game for a child while they are learning at the store being your helper.